I have been trying to write this blog post for a few days. I have struggled with what to say, what not to say, where we are, and where we are not. Now that spring has officially arrived and the daffodils and crocus have popped up, show season lurks just around the corner. I equate show season with the start of the school year. You kind of assume that you are moving up a grade (level) with the new year (season)…and when you are a chronic overachiever, you expect that forward progress. For years I have struggled to make the leap from a Training/First Level rider to one that can hold her own at Second Level. While some people would say that reaching the FEI levels would mean the most to them, reaching Second Level has been the Holy Grail for me. It is the level where it feels like the “real” dressage work starts – you have to show collected and medium gaits, you have to be able to move your horse’s shoulders and haunches independently, you had better be through and connected, and it all has to be done in sitting trot with an independent seat. In January, I honestly thought that we would be ready to try out Second Level Test 1 at a schooling show in April. I was giddy when I thought about it. This was it! We were going to go out and show everyone that we do have some dressage skills. There was work to be done on the simple transitions, but we had two and a half months, so it was not going to be a problem…and then the snow came…and All. Progress. Stopped. Dead. As we have restarted, reality set in that we were not ready. And then a bigger reality set in last weekend. One of my besties with some serious riding skills came to the barn with me and hopped on Ike. She last rode him 2 years ago when steering was still questionable most days. She took just a few minutes to get a good feel for where he was, and off they went. I will say it was nice to see Ike in action since I only get to see him on video with me astride. When Miss L figured him out, his leg yield was stunning. When asked for a flying change, Ike nailed it. Whoa! She then played with his simple changes and nailed them. Then the clouds parted and the realization set in – poor Ike’s progress is inhibited by his owner’s lack of any dressage skills past First Level. Poor boy. He is clearly ready for Second Level and could enter Second Level Test 1 in April, but sadly, I am not. Too bad he wouldn’t be willing to give it a go on his own. Heck, I’m even willing to call the test for him. This year will be about bettering our dressage skills and finally riding down centerline for our first Second Level test ever. Until we are ready for that, we will strive to improve our weaknesses (turn those shoulders!) and better our First Level scores from last year. That is the beauty of dressage. 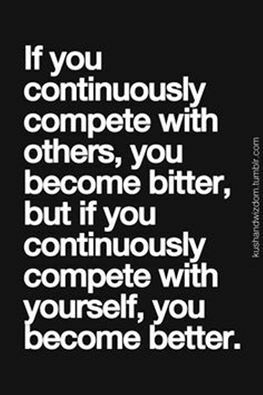 Even if you never bring home a ribbon in a class, you can still compete against yourself. Wish us luck! I often wonder why dressage riders don’t ride out of their comfort level more. Okay, you might not have the world’s greatest 2nd level dressage score your first time out – maybe it won’t be perfect, but if you don’t try, you will never know!! It is a schooling show – go for it!! It may be amazing! And if it isn’t – oh well, will anyone die, or be forever damaged? Not likely! Also, each movement is on it’s own, so one isn’t great – the next one will be awesome. The great thing about riding is no matter how much you know or how good you are, there will always be others who know less and others who know more, others who are better and others who aren’t. Reach for the stars, you just might surprise yourself! Here is the actual line. We only get better by challenging ourselves and, as always, dead last beats DNF (did not finish) which always trumps DNS (did not start)!